Summary: Neuroimaging technology can help determine the success of failure possibilities of cochlear implants for those who lose their hearing during adulthood. A cochlear implant is an electronic device capable of restoring hearing in a profoundly deaf person by directly stimulating the nerve endings in the inner ear. This technology enables people who have become deaf to be able to communicate orally again, even by telephone, and children born deaf to learn to speak and to benefit from normal schooling. However, results can be extremely variable, with implants having only little benefit for some patients, without any means of predicting failure based only on purely clinical factors. Using data from brain imaging techniques that enable visualising the brain’s activity, a neuroscientist at the University of Geneva (UNIGE) and a Parisian ENT surgeon have managed to decipher brain reorganisation processes at work when people start to lose their hearing, and thus predict the success or failure of a cochlear implant among people who have become profoundly deaf in their adult life. The results of this research may be found in Nature Communications. Up, red : right occipito-temporal coupling during deafness, indicating a poor cochlear implant prognosis. Below, blue : right occipito-tempora uncoupling after deafness, indicating a good cochlear implant outcome NeuroscienceNews.com image is credited to UNIGE – Institut Vernes, Paris. A cochlear implant is an electric device designed to counter the loss of hearing linked to an inner ear deficiency, either congenital or acquired. First used as experimental devices in the 1970s, they have become commonplace since the 1990s. They provide many deaf people with a significantly improved ability for oral understanding and thus a considerable boost to their quality of life. However, despite the technological advances, there are still some 5 to 10% of adult patients who have become deaf for whom this technique remains stubbornly ineffective. In order to find an answer to this question crucial for clinical practice, Diane Lazard, an ear, nose and throat surgeon at the Institut Vernes (Paris) and Anne-Lise Giraud, neuroscientist in the UNIGE’s Faculty of Medicine, have sought to identify which brain factors might be linked to the success or failure of implants. The two scientists have studied how the brain of a deaf person manages to represent the sound of the spoken word and its capacity of re-using these representations after a cochlear implant. Anne-Lise Giraud explained: ‘The test went like this. We presented some visual stimuli to the subjects, in the form of written word, and asked them to determine whether two words, without the same orthographic ending, rhymed or not – for instance wait and gate. Subjects would then have to recourse to their memory of sounds and, using functional neuroimaging (fMRI) techniques, we observed the neural networks in action.’ Whereas the researchers were expecting that the subjects would be slower and less accurate that those in a control group of people without any hearing difficulty, to their surprise they found that certain deaf people completed the task quicker and more accurately than their normo-hearing counterparts. For ‘Super-readers’, who appear to be able to handle written words quicker than those with no hearing impediment, the brain has opted to replace orality by written exchanges and has restructured itself accordingly. The brain circuits used by such ‘super-readers’, and which are situated in the right hemisphere, are organised differently and thus cochlear implants give poor results. Other deaf people, those who carried out the task at the same speed as the control subjects, remain anchored to orality and therefore gain more benefit from cochlear implants. Unlike the ‘super-readers’, the latter manage to master lip-reading as deafness encroaches, and therefore maintain a central phonological organisation very similar to that of normo-hearing people, which uses the left hemisphere of the brain. There are therefore two categories of subjects whose brain circuits function very differently. This research points to the essential role played by the interactions between the auditory and visual systems in the success or failure of cochlear implants. Their outcome will indeed depend on this cortical reorganisation. Such results also explain why it is so important to be able to equip congenitally-deaf children during their first few months, i.e. before the onset of the reorganisation of the visual and auditory brain circuits, a process which may compromise their ability to access orality. Image Source: NeuroscienceNews.com image is credited to UNIGE – Institut Vernes, Paris. University of Geneva “When Writing Interferes with Hearing.” NeuroscienceNews. NeuroscienceNews, 3 April 2017. University of Geneva “When Writing Interferes with Hearing.” http://neurosciencenews.com/writing-hearing-6332/ (accessed April 3, 2017). The outcome of adult cochlear implantation is predicted positively by the involvement of visual cortex in speech processing, and negatively by the cross-modal recruitment of the right temporal cortex during and after deafness. How these two neurofunctional predictors concur to modulate cochlear implant (CI) performance remains unclear. In this fMRI study, we explore the joint involvement of occipital and right hemisphere regions in a visual-based phonological task in post-lingual deafness. Intriguingly, we show that some deaf subjects perform faster than controls. 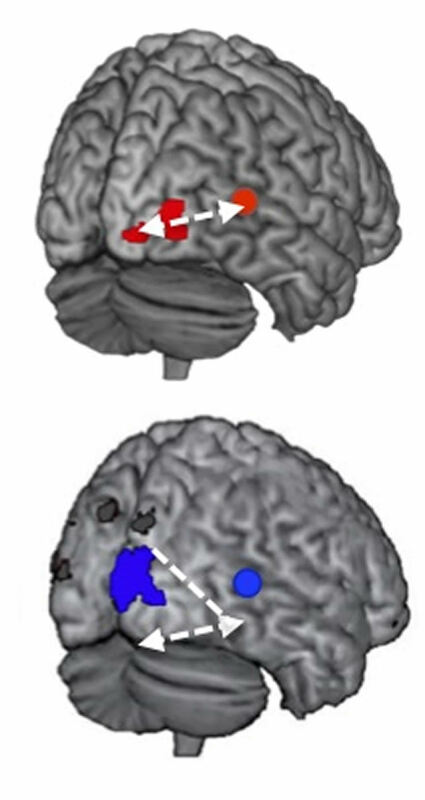 This behavioural effect is associated with reorganized connectivity across bilateral visual, right temporal and left inferior frontal cortices, but with poor CI outcome. Conversely, preserved normal-range reaction times are associated with left-lateralized phonological processing and good CI outcome. These results suggest that following deafness, involvement of visual cortex in the context of reorganized right-lateralized phonological processing compromises its availability for audio-visual synergy during adaptation to CI.